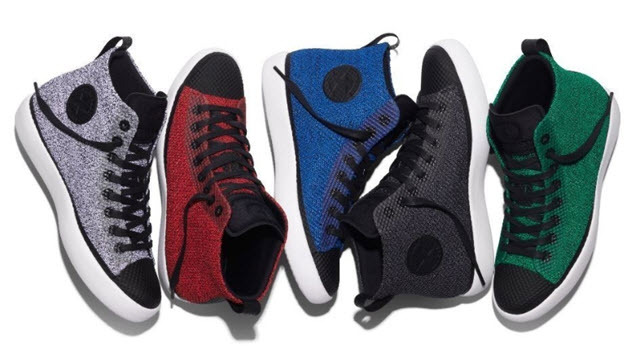 Converse has launched its Converse All Star Modern Collection. The new collection was inspired by the footwear brand's 1920 All Star sneaker and basketball heritage. It features Hi and Ox silhouettes. Features include Nike Hyperfuse, a contoured Phylon outsole, a TPU-fused overlaid toecap and a neoprene split tongue and lining. Bryan Cioffi, Vice President/Creative Director of Converse Global Footwear, says in a statement, "The Converse All Star Modern is a perfect fusion of our sport heritage with modern design. With this collection, Converse is delivering a comfortable, lightweight product that's new, exciting and modern, but still feels very Converse." The collection also includes the Converse Thunderbolt Modern (pictured below). You can find the collection here on nike.com.